The mattress company made this assertion in its recent deep dive into the sleeping habits of 1,300 Americans, which aimed to figure out just how many of us are getting our recommended 7-9 hours a night (hint: not many of us) and what we can do to maximize our Zzz’s. The participants were asked a series of questions that touched on everything from where they live (Coloradans apparently sleep super well) to what activities they do before they snooze. Researchers compiled these answers, drew up a few snazzy graphs and highlighted some of the characteristics that separate good sleepers from the bad ones. A particularly telling infographic shows the respondents’ favorite bedtime behaviors, or the activities they do between getting into bed and falling asleep. 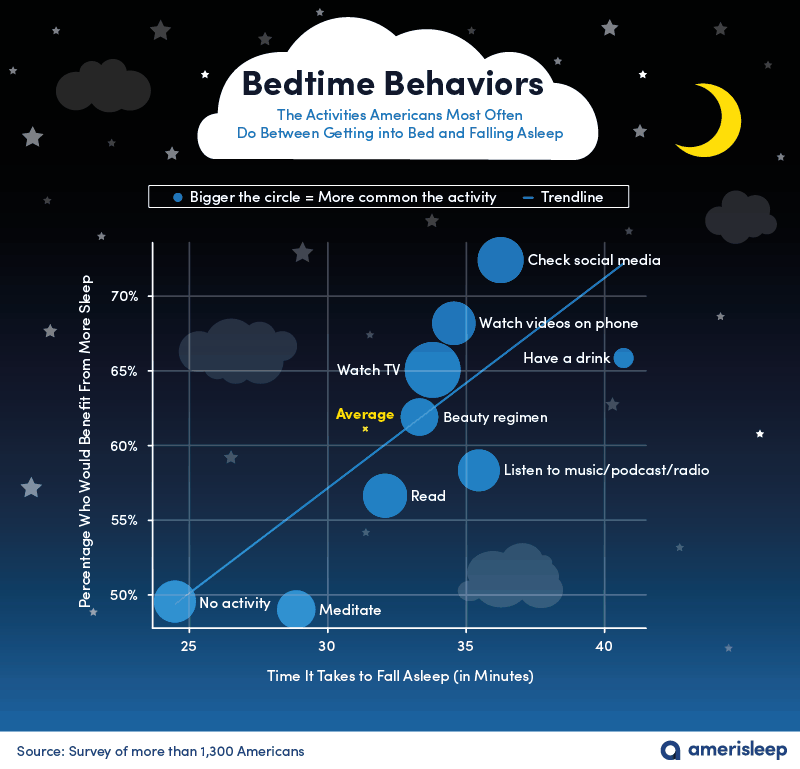 As the graphic demonstrates, the three most popular bedtime behaviors include watching TV, checking social media and streaming videos on the phone. Notice that these activities landed high on the Y axis, which means they’re also the preferred habits of people who admitted they could benefit from more sleep. 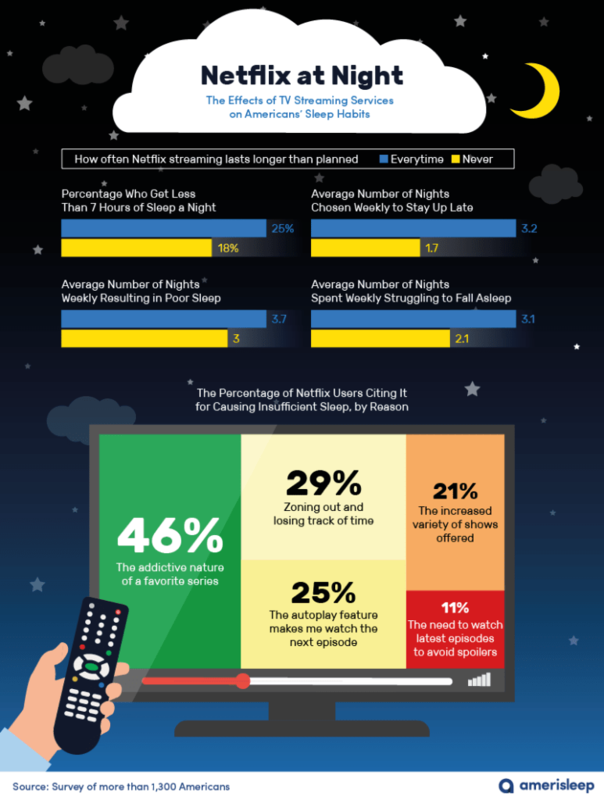 The Amerisleep survey goes on to suggest that a main digital culprit of these restless nights is Netflix. According to the data, Americans who said they regularly plugged into the popular streaming service before bed fell asleep 26 minutes later on average than those who never used the platform. Researchers posited that this extra time led to sleepers staying up unnecessarily late an average of three nights a week. Of those who acknowledged that their shut eye was negatively affected by Netflix, 46% said they lost sleep because of how addictive their favorite series is while 25% said the autoplay feature makes them watch the next episode even if they don’t really want to. On the flip side, the people who reported getting the best sleep were those who did absolutely nothing before bed. No reading, no meditating, no journaling, just a swig of water and a flick of the light switch before plopping down for the night. Researchers also noted that early birds—described in the study as people who prefer to rise early in the morning and go to bed relatively early in the evening—got a great amount of Zzz’s and felt more productive, creative and refreshed throughout the day. Conclusion? Ditch the reruns of 30 Rock, switch off your Twitter feed and let your preferred mattresslull you into a peaceful and technology-free slumber.